Retirement – or at least the traditional definition of it – is not on Doug Calaway’s radar. He’s been called a serial entrepreneur. Business is in his blood. Calaway graduated from the Florida Institute of Technology in Melbourne, Florida, with a degree in engineering and an MBA in finance. He worked in technology related to the space program, and then, when some people he knew were starting an engineering workstation company and asked him to be CFO, he moved to Pittsburgh. At age 29, with his wife, Mary, expecting their second child, he and his coworkers quit their jobs and formed their own company. Eventually, they sold the company to Hewlett-Packard. “The industry was growing too quickly for us to keep up with it,” he says. In the meantime, Calaway had moved from Pittsburgh to Boston. He was asked to start another company in New Hampshire, so he did – this one for equipment used by the government for classified information. In five years, he says, the company grew from $0 to $40 million and was on the Inc. 500 list two years in a row at number 156. He was nominated Entrepreneur of the Year by Inc. magazine, but lost to Michael Dell. The government eventually bought the company, and Calaway moved on to other ventures, including working for Kodak in their photo CD product line; starting a company called Easy Prints that allowed digital photos to be uploaded to a website and printed on photographic paper (and where he also got two patents); working on the prepress system for Al-Alam newspaper in Cairo, Egypt; and starting a company that does telemarketing for nonprofits. Calaway and his family moved back to Florida. There, he headed up an investment banking firm that raised money for companies and turned them around. When the Great Recession hit in 2008, Calaway says he decided to do something for himself for a change. But it wasn’t necessarily retirement. 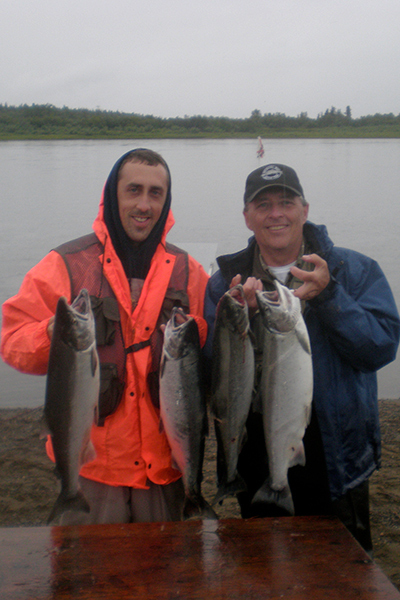 Calaway had moved temporarily to Dillingham, Alaska, on the Bering Sea, to work with the company. “In five weeks during the summer, they take about 30 million salmon out of the water,” he says. 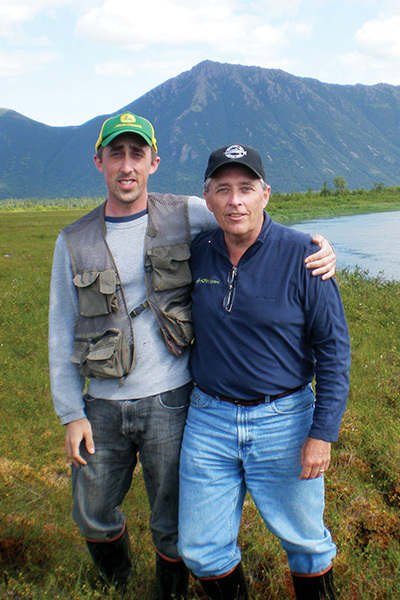 He also went snowmobiling with Todd Palin and fished behind Todd and Sarah Palin’s home. He also went bird and moose hunting. By this time, Calaway’s son John had been recruited by UNC-Chapel Hill to do some paid research and their youngest son, Mark, was also at UNC working in a lab. Calaway and his wife moved to North Carolina to be closer to them. 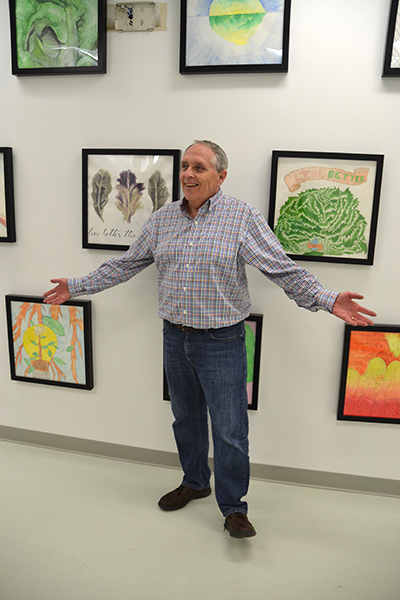 The idea of growing plants in water stayed in Calaway’s mind when he moved to North Carolina. “It got me thinking, I’ve got N.C. State, the number two ag school in the United States here; I’ve got Cree [an LED lighting manufacturer] in my backyard, because LED lights are what really makes it work; I’ve got North Carolina, which has an ag history of a couple hundred years. Maybe we can put this together,” he says. 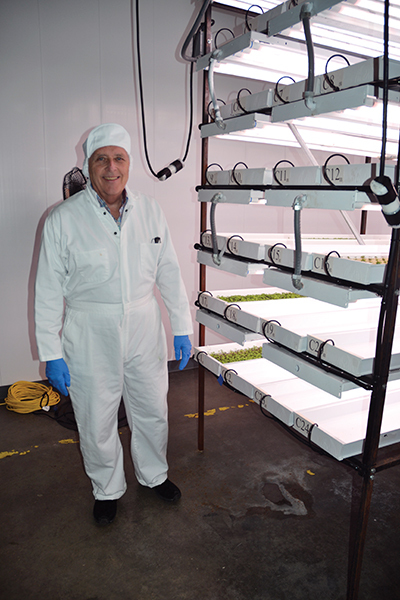 He had settled on the idea of hydroponics – using nutrient-rich water, rather than soil, to cultivate plants. Unlike aquaponics, no fish or fish waste is involved. 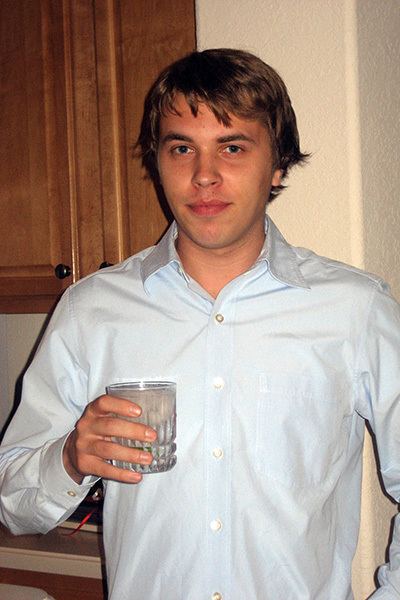 In January 2018, Mark took his own life. So they did – and Your Local Greens was born. Of the 47 investors in Your Local Greens, says Calaway, 38 of them have a special needs family member. And three of the four senior staff members at the company have a family member with special needs, he adds. Your Local Greens works with the Autism Society of North Carolina, the TEACCH Autism Program at the UNC School of Medicine, as well as Disability:IN North Carolina. “They have this program they put together to teach companies big and small how they can hire special needs folks and put programs together to put them to work,” says Calaway. Philips is scheduled to visit the company later this year to film a documentary, which will be pushed out at their corporate level. The building in Burlington, N.C., that houses Your Local Greens is a former hosiery plant that had been sitting dormant for five years. “The owner of the building is also an investor in this company, so it just all made sense,” says Calaway. Currently the farm is in what Calaway calls “stage one,” using only about 17,000 of the available 60,000 square feet, and there are plans to expand. 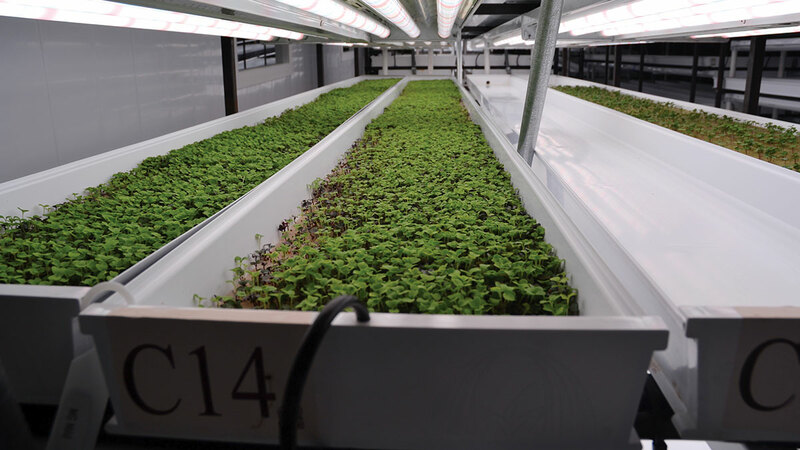 One of only three hydroponic farms of its type in the country, Calaway says that of the United Nations’ 17 Sustainable Development Goals, Your Local Greens meets 13 of them. The farm has also been USDA inspected and meets the criteria for GAP (Good Agricultural Practices) and GHP (Good Handling Practices) certification. The plants grow in a cleanroom, and no pesticides are used. 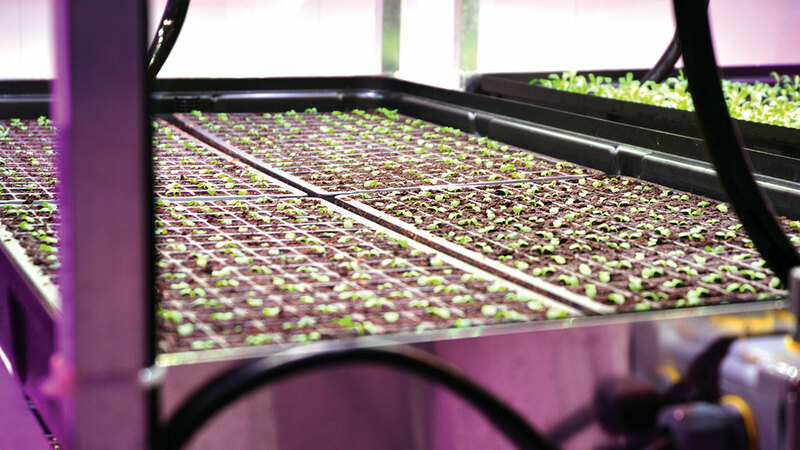 Seeds for lettuce and other greens (and microgreens) are placed on trays and put into a germination cart, where they sprout overnight. Then they’re brought out to the main part of the farm where the plants are grown in trays of water fortified with nutrients and minerals. The water, Calaway adds, is filtered, more nutrients added, and reused—all part of the farm’s sustainability. Seeds are placed on trays and put into a germination cart. At Your Local Greens, day is night and night is day – the LED lights that help the plants grow come on at 4 p.m. “We play Mother Nature here,” says Calaway. Currently, the post-organic lettuces, microgreens, and salad mixes from Your Local Greens are available at Weaver Street Market locations in Carrsboro, Hillsborough, and Southern Village. Calaway is also talking with other grocery store chains about carrying their produce. But does he have any plans to “officially” retire? “I’m not one of those who’s going to sit still,” he says. 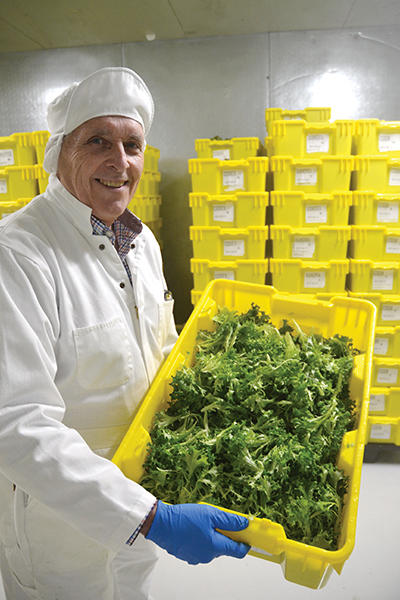 In addition to his work at Your Local Greens, Calaway recently turned around a telephone company in upstate New York and helped a nutraceutical company go public. He also is the “finance guy” for his church, and keeps the books. Retirement, it seems, is something he’ll save for his spare time. 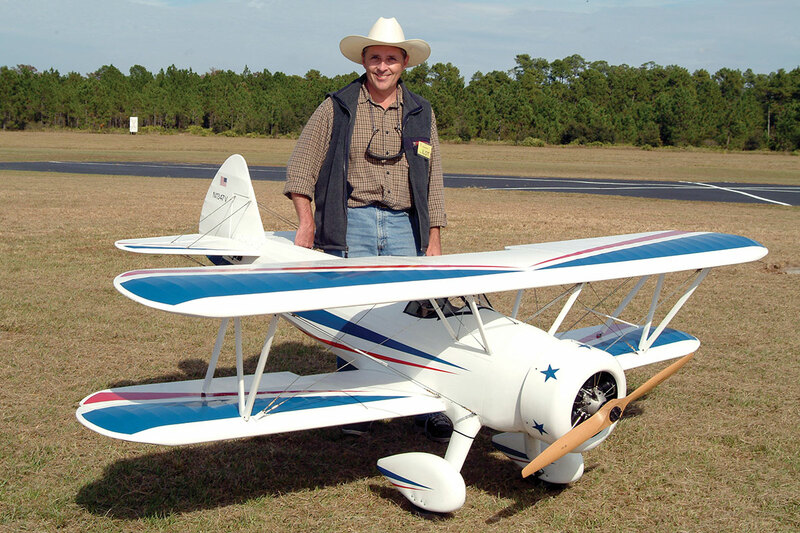 While living in Florida, Doug’s hobbies included remote-controlled airplanes.